I can’t tell you how many times I didn’t feel like going to church, but when I did, I got something from it, and this past Sunday was no different. Though it was Easter, I did not feel like going to church and I’m not talking about the 11 am service. No, I am talking about the “son”rise 6 am service. And you know the funny thing, people always say, “since Jesus got up, I guess so can I.” Nope, I disagree. He was sleep for three days. I would’ve gotten up early too if I slept that long. (insert laugh here) Anyhow, as you can imagine, it was hard getting up that early, but I did and I am so glad I did. Like I said prior, whenever you go to church, there is always something there that you can take away, whether it’s a song, the message, a conversation, a hug, or a chance to actually pray purposefully. In my case on Sunday, though it was a part of the message, what I took away was not in the message. The preacher of that lovely early morning hour came spoke on the story of Jesus appearing to his disciples after his resurrection, and had a fish fry with them. The highlight of the sermon was on Jesus confronting and questioning Peter’s love for him, but I decided to read on the rest of the conversation, which wasn’t addressed in the message, and was blown away. I actually did an article on another site about it, but Jesus was a funny dude. I mean if you really just read the dialogue in the Gospels alone, he will have you lol-ing for real, because he had absolutely no problem keeping it real, which is exactly what he did in this story. After walking along the shore and getting back on good terms, Peter noticed John behind them and asked Jesus what he was going to do with him, and Jesus pretty much told him to mind his business and not to worry about it because it had no consequence to him. I am pretty sure I had read this passage before, but it had been so long, so it was refreshing to read it again. What Jesus said to Peter is something that he is telling us today, and that is to stop worrying about what God is doing or going to do in someone else life, which is part of the reason Peter sank before, because he lost focus. If you constantly compare yourself to others and get caught up in what they are doing and how the Lord is blessing them, the Lord has little capacity to bless your fruits because you are not focused on the task He has given you. In today’s language, I think Jesus would have said to Peter flat out “mind yours.” It’s so easy to get caught up in other people’s story, especially when they seem to be further along than us or they happen to be doing the same type of ministry or work we are, and we get prideful and jealous. Just considering the story, Jesus was actually reinstating Peter after he had denied him, so I think Peter wanted to get off the hot seat for a minute; same with us. When the Lord is working on you, don’t start pointing finger or passing blame. There is another lie that is floating around that says “your actions/attitude determine my attitude and my action are up to you.” That is a dangerous philosophy to live by because as just as it sounds, you can’t determine the consequences, and at the end of it all, you are responsible for your own actions; you will be accountable for how you reacted, not how others acted. Bottom line, focus on yours. Stick to your function and let God do what He wants in that other person’s life. What the Lord has for them is for them and what’s for you is for you – that also goes for God’s time table. 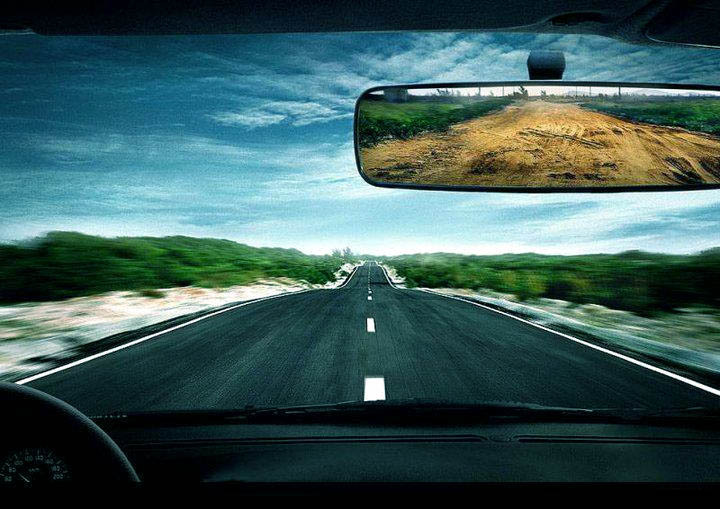 Just like the driving analogy, when you drive you can’t keep looking at your past in your rear view mirror, or else you will crash; likewise, you will crash if you keep looking at the person or people in the lane beside you. As Jesus said to Peter, there is no reason for you to question what God is doing in someone’s life, especially if it has no bearing on what He is doing in your life. If by some chance it does, still, focus on being you for the purpose and task set forth for your specific journey, keep it in prayer, and in due time God will work things out and merge you together.